In the wild, rabbits spend several hours every day foraging for food. House rabbits generally get their food served in a bowl at regular intervals, which means they never have to go hungry, but it also leaves them with way too much time on their paws for boredom and mischief. Luckily, rabbits are naturally curious and smart. They are often quite playful and food motivated, which opens up the doors for logic toys designed to sharpen the mind and offer an interesting challenge. Rabbits are genuinely smart animals and they have the potential to learn a variety of skills, especially if their humans are willing to encourage such growth. As we all know, a bored rabbit is a destructive rabbit! Logic toys can help keep boredom to a minimum. Plus, it’s no secret that mental stimulation is important for a happy and healthy life. A logic toy is any object that requires problem solving to get to the reward, which is usually an edible treat. A large number of logic toys is commercially available. Some were designed for rabbits, some equally suitable ones were made for dogs, cats, or even children, but you can also make your own. 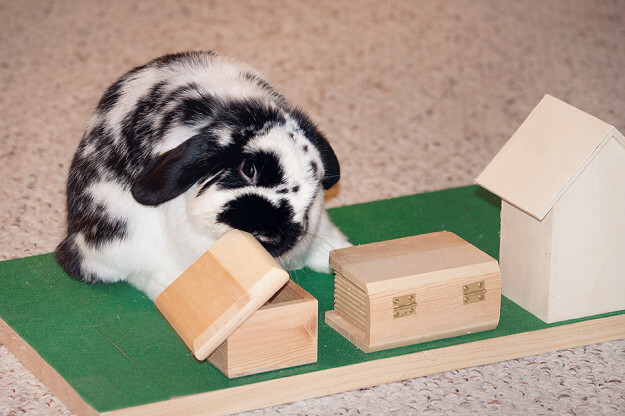 Logic toys for rabbits often involve lids that need to be opened, drawers that need to be pulled, sliders that have to be pushed, balls that need to be rolled, or pegs that have to be removed. They come as easy or difficult as you like! 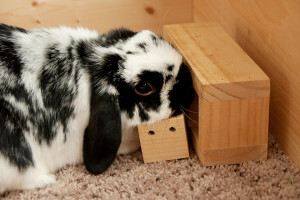 The best time to teach rabbits a new skill is when they are hungry and active. Right before feeding or snack time, for example! For teaching it’s also important to pick your rabbit’s favorite treat. 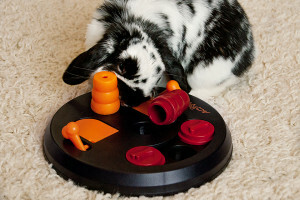 Depending on the logic toy and the rabbit, the treat could be dry, such as flower buds or freeze-dried strawberries, or fresh, such as parsley or bits of apple. Now find a quiet space without distractions and sit down on the floor with the bun and toy in front of you. 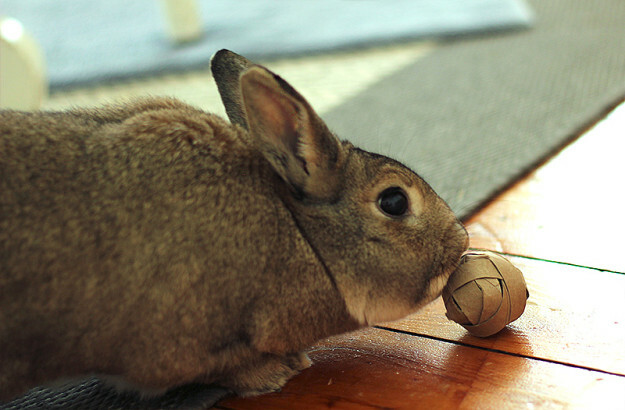 Let the rabbit sniff the treat and put it into the toy with the bun watching. Perform the action required to get to the treat with your hand and point to the treat, over and over. You can let the rabbit eat it once or twice to keep the interest up, but encourage him or her to get it without help in between. Be patient and praise your bunny for finding the treat, even if it happened by accident or with your help. If your rabbit loses interest in the game, stop and try again later. After all, it’s supposed to be fun! Some rabbits might understand what they have to do to solve the logic toy puzzle quickly; some may need several teaching sessions. 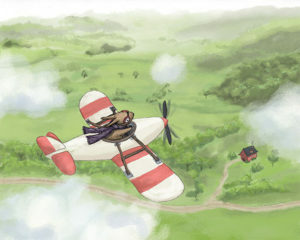 The more skills they acquire, the easier it becomes to pick up another one. If the toy is safe to use without supervision, try leaving it with the rabbit in between teaching sessions. A bored rabbit can be quite determined and might figure out how to get the treat without help. Find an empty oatmeal or coffee container (the cylindrical ones with a lid). Punch 10-15 penny sized holes all around it, add dry treats small enough to fit through the holes, and close the lid. This will make a great first treat “ball”! Just make sure your bun doesn’t eat the whole thing. 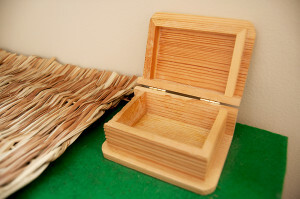 Get 2-3 small boxes from a local craft store. They should be made of wood and be untreated/unpainted. Pick those that have a lid a rabbit could open by flipping, pushing, or pulling. The ones with hinges should be okay, but if there are magnets you will have to remove those. Hide treats inside the boxes and let your rabbit find them! This works even better once the boxes are glued to a base, such as a wooden board. 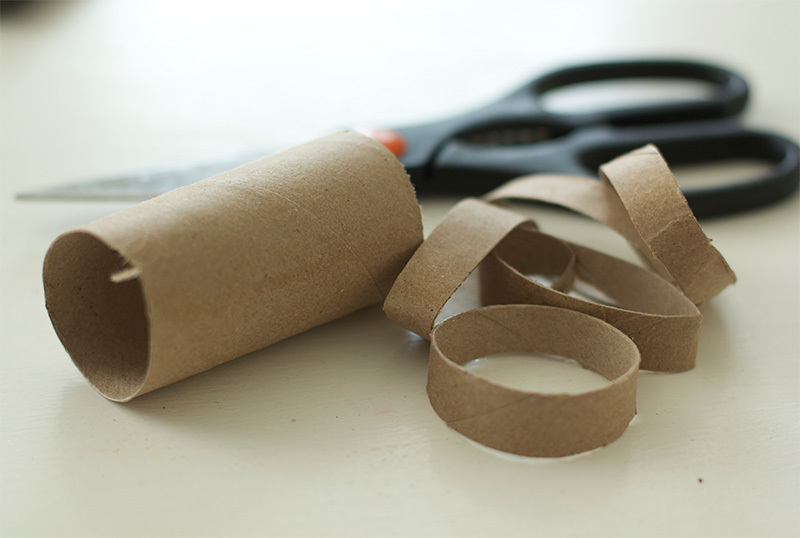 Take an empty toilet paper roll and cut it into even rings, about 0.5” each. Place them inside each other criss-cross style to form a ball. 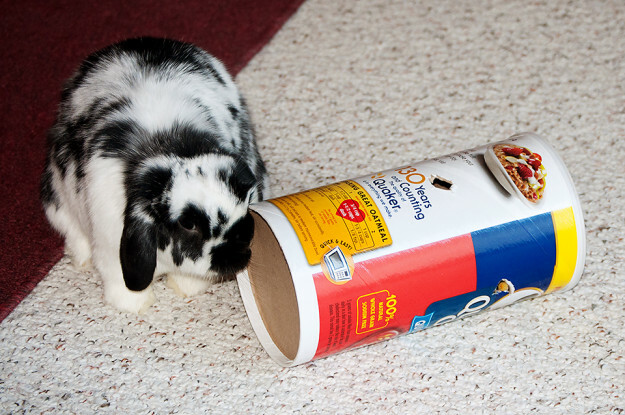 Add a favorite treat in the middle, such as a piece of banana, and let your rabbit figure out how to reach it! Christina Chivers shares her home with two Holland Lops named Bunny and Bailey. She's also the owner of Bunny Approved, an online shop full of toys, snacks, and accessories for house rabbits.